These are the materials we used. We had 34 exposed aggregate stones that each weigh about 40 pounds, so just with the stones we moved some 1400 pounds. But before we put down the stones we had to spread 20 sacks of gravel at 100 pounds a sack, or a ton of gravel. Then we put down 10 100 pound sacks of sand for another 1/2 ton. So all together we moved close to 2 1/2 tons of material to construct this thing. And that doesn’t count all the soil we moved! No wonder it was tiring! Here it is in an early stage of work when we have the grass out and the gravel just begun. You can see the old walkway we started from that is the same style of bricks. We wanted a consistent look to it so we used the same materials. We put down about 3-4″ of gravel and 2″ of sand to make the bed for the stones. We ran all the dirt thru a screen we’d devised earlier just for that purpose. It sifts out the stones and the grass. We compost the grass and toss the stones under the deck. But the soil we used in the garden to increase the level with a few inches of new soil. In order to fit it all in there we raised the sides of the beds of the garden about 6″ to allow for the new soil. We’ll have to mix in compost to make the garden rich again and will do so once the current crop of kale and mustard greens, and the last of the tomatoes, are gone. Here you can see the gravel starting to be spread on the path. You can see one of the stones set here to get a feel for the level. Once the gravel is at the right depth we added the sand to bring the depth up and to even it all so that it can be exactly the same level as the current walkway. We did OK at that so the line is straight and the path is on an even grade and has no bumps or low spaces in it. Next we put down the stones to finish it off. Here is the actual walk set in place. We threw a bunch of sand down over it to fill in the cracks and make it all solid. We had to cut some of the stones to fit with the step of the greenhouse. We had a diamond masonry blade to use to cut the stone. It did a great job as long as we wore masks to keep the stone dust out of our noses and dripped some water on the blade to keep the dust down and the blade cool. We just used our circular saw we already had and have used for many previous projects. Here I am sweeping the sand over the walk to get it into all the cracks. It took awhile and then we let it settle for a day or so before watering it in and getting it all smooth and nice. The sand makes it all look like a solid path. You can see we did a pretty good job of cutting the lawn back to the edge of the stones so that the grass will grow back even and make it all feel like it’s been there for awhile, which it does today as I write this. Here it is all finished and ready to use. You can see it’s much lighter than the old one, but then the ‘old’ one was put in new just a few years ago to match what we had then. It’s weathering well and looking as good as the original old stone we reused in that first project. The new stone will weather just as well and look consistent in time. This is being so useful to us already as we go back and forth to the garage and the greenhouse. We can stay dry now and have a clean path to walk on so we don’t track mud into the house. This was a relatively big project but we got it done despite the hard work. It’s not that difficult to do if you want a walk like this. It was work of course and you have to have a good eye for the lines so it comes out straight and level. But that difficulty is OK when you consider that you’ve made it yourself and can be proud of your work. It’s worth it to have done it ourselves. We’re glad we put it in despite all the work, and you will be too if you decide to try this. I’m ashamed to say I don’t have the correct botanical name for this plant. I planted it in my greenhouse as a seed two years ago and grew it over the winter for two years to get it to where I could plant it out this spring. I had about 1/2 a dozen of them but this is the only one that got to blooming size. 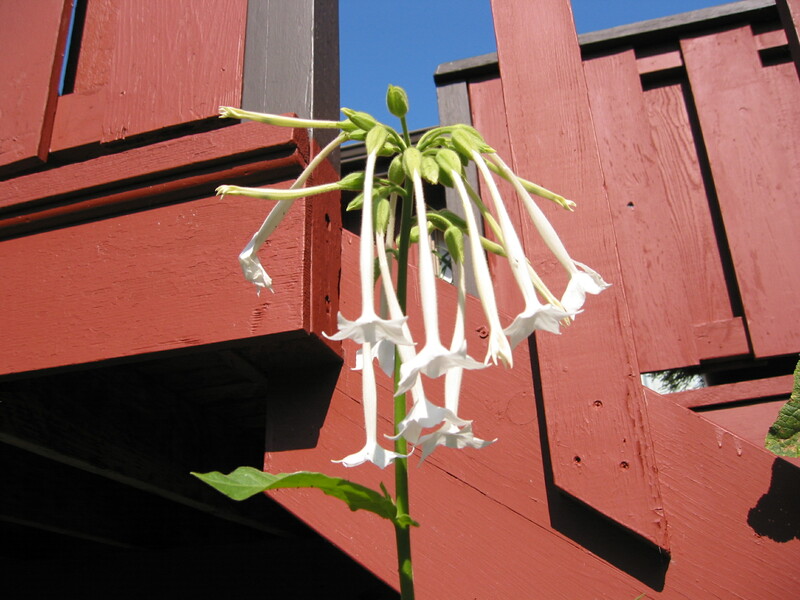 It’s a beauty and has really fragrant flowers, even in daytime let alone at night when it really shines. It’s just lovely. Here it is in the bed of mostly wild flowers I re-seed every year with some seeds I save and some I get new. You can see the old heads of Phacelia or Bee’s Friend in here, and some Clarkia and of course the old Hollyhock that has been there for 3 or 4 years now. And the poppies of course. I have yet to make poppy seed cookies with the seeds but I’m saving them and replant them every year to great joy. They’re so beautiful. 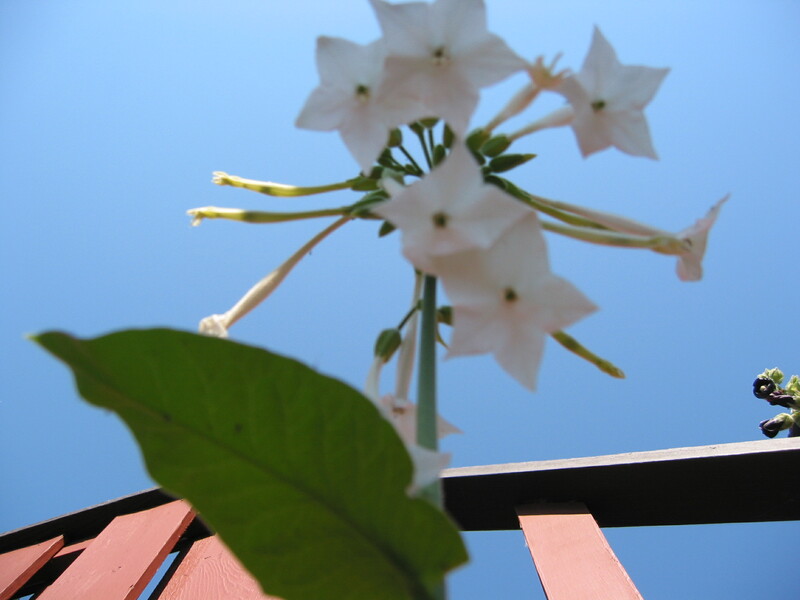 And finally here’s a shot I took by sticking my camera up under the plant so I could see the underside of the flowers. They’re stars! You get a good sense of how they look from this vantage point. I’m hoping I can save some seeds of this one for next year, or maybe two years if it follows the way it’s grown and takes me two years to get a blooming plant. It’s all worth it and maybe next year my greenhouse heating cable will work right and I won’t lose all my seedlings like I did this year. Ah well, the vagaries of gardening, eh? And Pink, and Purple, and some in between colors too, but they all fit in the spectrum of Red. I’m amazed by all the plants I have that have red tones to them. It’s obviously a pretty popular color. 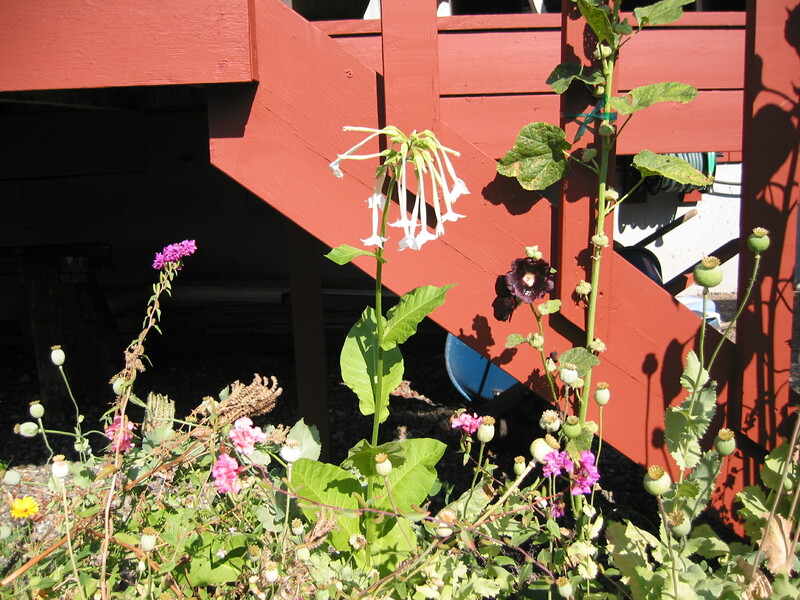 I’ve tried to add them to the garden because they add so much interest and I love the varied hues they represent. Some of them are in the leaf and others are in the blooms, but all are in the reddish range and provide some intense color to the garden at most any time of the year. These pictures cover the last few months since things started to bloom and leaf out well, tho they’re not in any particular chronological order. First up is a Yarrow that just keeps getting better each year. It’s called Paprika and has intense red blooms with yellow flecks in the centers. Then are 3 different red Japanese maples that are even named red, like the Red Dragon and Red Pygmy, and the Bloodgood is considered the most excellent red cultivar of Japanese maples you can find. It’s been in circulation since the 1800’s sometime as I recall. The weeping beech I planted as a memorial for my brother and it has his ashes underneath it. It’ll get taller eventually but since I stopped staking it up it’s stopped getting taller for now. I’m hoping it’ll mound up on itself as time goes on but it may just get wider I’m not sure. The Red Fox Katsura is hard to see I know but it has deep purple blue green leaves that are even more red at first growth. It hasn’t grown this year at all which concerns me but patience is called for here and I’m trying my best to just allow it to grow on its own pace. It’ll be a lovely tree in time. The Physocarpus, or Ninebark as they’re called, is a small shrub with deep maroon leaves and light pink flowers that didn’t bloom much this year but it grew well. While the Blue Peter Rhodie has been here for years and always puts on a fine display of flowers. The lavender and the sage are in the Herb bed and I’ve gotten a lot of good food from this bed. I harvested my savory and oregano awhile ago while it was in fresh growth and some rosemary too. I’ll have a good stash for cooking this year. The Mountain Fire Pieris, or Lily of the Valley shrub, has such fine red tones when it first leafs out that turn to a light mahogany and then to green as time goes on. Buds will set on it from this fall and it’ll bloom in winter with white blooms. I’m rooting for this one to get bigger so it screens us from the neighbors on the deck. It takes time tho so I have to be patient again. It’s required when you a start a garden mostly from scratch and use smaller plants like we did. It takes time and waiting is hard for me but I do it because what else can one do? I know the Columbine I showed is more blue than red but it’s so beautiful I had to show it. It’s a self sown seedling that just came up in a bed of them I let happen. I love them so much I just let them grow since they aren’t in the way at all. The Heuchera is in the front yard and adds some nice color to that area there with its delicate blossoms and fine maroon leaves. The Anna Rose Whitney Rhodie is in the back of the whole garden and will be a foundation of the corner of the yard as it gets bigger which is doing well now. The Barberry is a small shrub that has to compete with the Spruce next to it on one side and the Giant Sequoia on the other. It seems to be holding its own tho so I’m not worried. A little bit of pruning on the spruce and it looks fine. The next azalea is one Louie planted years ago so I don’t know its name but it’s sure lovely isn’t it? Bright and lush it always makes me smile. So does the Ward’s Ruby, one of my favorite azaleas. It’s a kurume so it doesn’t get too big but has loads of blooms when it does so. The Bow Bells and Ken Janeck Rhodies both come on light pink and then one changes to deep pink and the other to white as they age. Both are lovely. The Ken Janeck is a Yak rhodie, a small form with huge leaves that I love. Very cool. Clearly the Tulips have been here for awhile and it’s amazing that they still come up thru the soil we put there and the plants grow thru them now. They add some bright color to the winter garden when they bloom. The Elephant Ears or Saxifrage, are in the front of the whole garden and provide a soft haven of their flowers with their lush foliage. I love the deep color they have. The Thrift, the Daphne and the Bleeding Heart are all in the same area and are quite wonderful when they all bloom together. The Daphne is so fragrant too, it’s possible to smell it standing up next to it but if you really want to smell it you have to get down on your knees. It’s wonderful. The Blue Diamond Rhodie has grown a lot this year but only bloomed a bit. It’s so healthy tho I’m happy with it. The currant is blooming well in this picture but hasn’t grown much yet this year, as have so many plants. It seems to be the year of patience for me this year as I’ve said before. Ah well, as long as they keep growing I have faith that they’ll do well in time. The Racemosum Rhodie is a species Rhodie that has wonderful light pink blooms at an early stage in the season. They come when you’re just tired of winter and need a bit of color in the garden. They provide some wonderful blooms. The Winter Daphne has wonderfully fragrant flowers in pink and the Ural False Spirea has such cool pinkish tips to its growth I’ve included both which live next to each other in the front yard. You can smell the daphne all over he yard when it blooms. The Goshiki Kotohime maple means “variegated old harp” in Japanese. It supposedly reminds one of the Koto, a stringed instrument that is endemic to Japan. A lovely plant and a wonderful instrument. This is the new growth that is so very bright and then fades to green as the year progresses. Very lovely. The Heath is in the Heather garden and adds some blossoms in winter when the heathers are dormant. The next shot it is of under the starting bed in the greenhouse and has a Persian cyclamen and a Tradescantia which both are doing well this year. They get a bit of water from the bed but we still give them extra to keep them going well. Last is a Moyers Red Nandina in full color with both leaves and berries red as can be. It’s a nice one to finish off this tour of red shades I think. I hope you enjoyed this tour of Red. I’ve done blue before but never red and it seemed like it was time to do so. With all the maples in particular and the other plants now in such fine colors I just had to share them. They brighten up the garden like nothing else and are so varied as you can see that they provide much interest even beside the color. The forms and the textures too add dimensions to the whole interplay of color and style in this garden as they do in so many others. Some of these next posts will take us back in time a few years to when we first started some of the garden. I’m going to do a bit of an overview of how we built our greenhouse first. We started with a blank wall where the garage ends and we begin the work to level the ground to put in the greenhouse. We left the floor as dirt with gravel on it eventually, so it’s really grounded in the earth well. To start the building itself is a picture of the framing of the foundation for the walls. After that we poured concrete mixed by hand in a big box made for it and put in the foundation. It’s got a wide foot on it and comes to a top of 4 inches wide to accommodate the frame. We poured it in a day, or was it night, I forget.. We worked at all hours to get this one done. These first shots are from January 2010 when we started to build. Winter was not bad that year so we could work fine thru it. Next we start to frame it and the walls are partly up here. We definitely overbuilt the thing since we managed to score a huge pile of wood at a local lumber store and got most of the wood for a mere $45 dollars. We got 2×8’s and 2×10’s and 2×4’s and trim wood and all sorts of stuff that they had in a special pile to sell cheap, So we took out generator and chop saw down to the store and cut the pieces to fit the van and hauled it all back home. It was a real deal and made the cost of the greenhouse much less expensive than it would have been. We also scored on the windows. We found some big Millgaard last forever windows at a neighbors house where they were giving them away. They’re both double paned and are some 4′ wide by 3 1/2 high and make up the south west corner of the greenhouse. It’s was a real deal that saved us hundreds of dollars. It’s great when neighbors share their cast offs and they can be reused in our own place. Thanks, neighbors! Next is a bit more framing with the door in it. Then one of the initial cladding of fiberboard to make the walls out of. Then the cladding with the door in it as well. We got a new storm door to put in since we don’t have a lot of light in the north side since the sides are walls instead of windows. So this big glass double paned door works great. It’s useful for letting in the light and keeping in the heat both. Here are some interior shots as we put it together. In one I’m putting up some insulation which we put on all the walls. The garage was already insulated so we didn’t have to worry about that side. The whole place is insulated well with the thickest we could put in and it seems to work well. It’s sealed up really tight and when we first finished and shut it it was so tight we called it our Volkswagen Greenhouse. It would float! We had to open a window to get the door closed at first it was so tight!! Here’s the seed bed all ready to go with the covers on it to hold in the moisture and keep the seeds moist and warm. There’s a coil of electric wire in the sand in the bed that heats up and provides bottom heat to the seedlings as they start to grow. 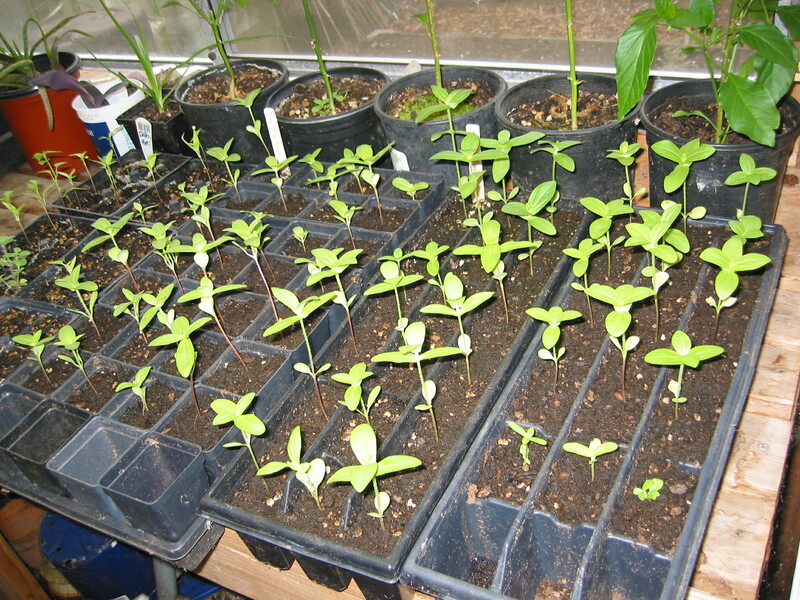 It makes a big difference in starting seeds and in keeping the whole greenhouse a bit warmer when it’s on. But we only use it some of the year of course as heat. The rest of the time we just put plants there to use the space. Next are seeds in the seed bed growing. They look so cool and this was so exciting to see for the first time I’ll tell you! This is my tool rack, or one of them. 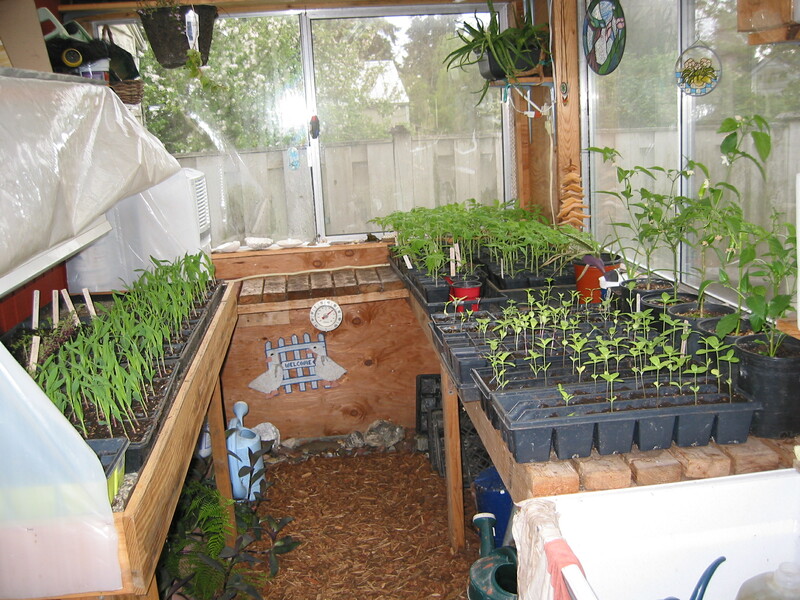 We have to use part of the greenhouse as a tool and storage shed – a potting shed if you will. It’s actually a combination of potting shed and greenhouse and I like the two combined. We both love to just hang out and sit in here on a rainy day and listen to the rain on the roof. It’s all done with fiberglass so the whole thing gets lots of light. So even tho some of it is walls there’s plenty of light to allow things to grow well in here as the years have shown us. So that’s it. I made it in one post which surprises me. I guess it’s a lot to take in but it’s from start to finish, more or less, and I’ve given you an idea of what it takes to build a greenhouse. Or at least This greenhouse, anyway… The last pictures were taken in April of 2011 so we did all this in about 3 months or so. It was a lot of work but we’re so proud of it. It’s allowed us to grow so much good food and flowers it’s all been worth it. We get to grow all sorts of things we couldn’t grow outside, like the peppers we still have going after two years. It’s a treat to have a greenhouse and if you have one I hope you’re enjoying it as much as we are. It’s a great thing to have to enhance your gardening, even if it’s a little one like ours. BTW this whole place is only about 6 x 14 feet overall with a ceiling of 7ft or so. It’s compact and just right… I wouldn’t want anything bigger or I’d go crazy trying to fill it. It’s big enough that we’re happy with it and will be for years to come. I posted awhile ago about my greenhouse, when it was still in the throes of clean up and I was far from this day of amazement when I have things growing all over the place. I seem to have good luck in starting certain things from seed and then transplanting them to small pots and finally to the garden. This year I focused on tomatoes and some greens and of course some corn. Here’s some pictures of the greenhouse in full production mode. The first shot is one of the whole greenhouse from the doorway. It shows the starting bed on the left where I have heating cables in the soil to allow for greater germination of the seeds. I cover it all with a plastic cover to keep it moist and it works great to start all sorts of things. There are a lot of corn plants in the starting bed and on the right are the ones that are growing to to become plants for the garden. You can see a lot of tomatoes and some other seedlings, like zinnias, one of my grandmother’s favorites which I wanted to plant a lot of this year just for nostalgia’s sake, and because I also love them. The second shot shows the zinnias by themselves. Next is a permanent part of the greenhouse under the starting bench. 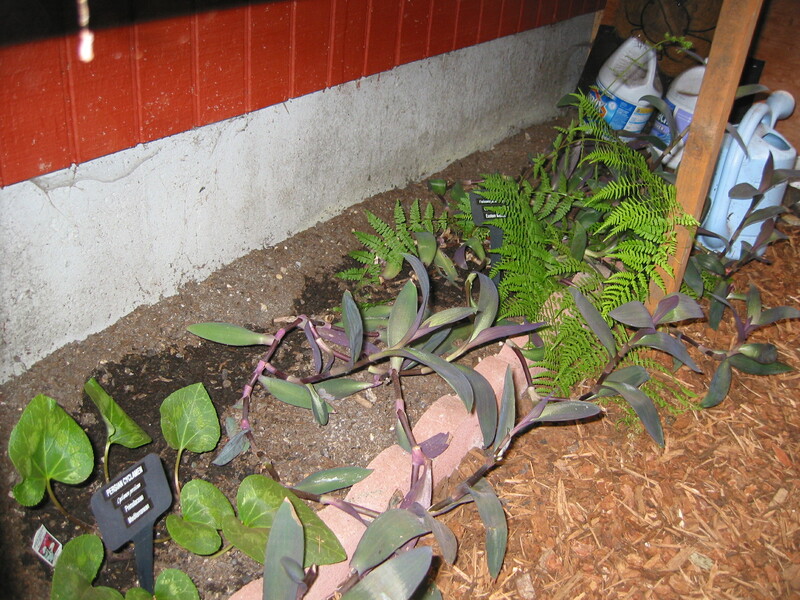 I wanted to have some tender plants growing year round so I planted a Tradescantia Purple leaf form that sprawls all over the floor and I have to keep it trimmed back some. There’s also a nice Persian Cyclamen that blooms quite nicely in winter and later into spring, tho it’s done now. It makes for a lovely scene under the bench for some year round color and foliage. There’s also a native fern growing wild in the tradescantia that I’ll have to remove someday as it’ll get too big but it’s so pretty now I’ll leave it. 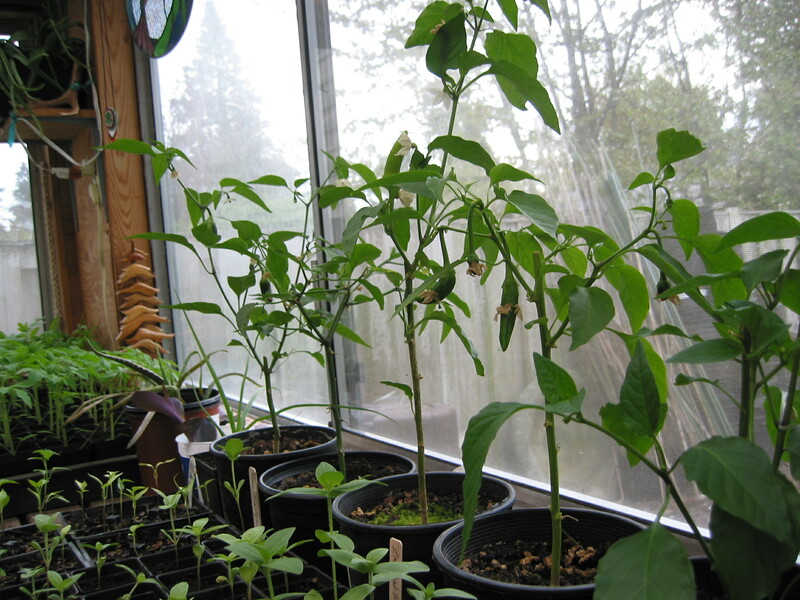 In the next one you can just barely see the little peppers on the plants I held over thru the winter in the greenhouse and pruned back to allow for new growth. To my surprise and joy they came back strongly and have been blooming well and already have set some fruit. How welcome to see because the peppers from this year are just still sitting there. So it’s lucky I have the ones from last year to have some fresh hot peppers for my cooking as they grow and develop. 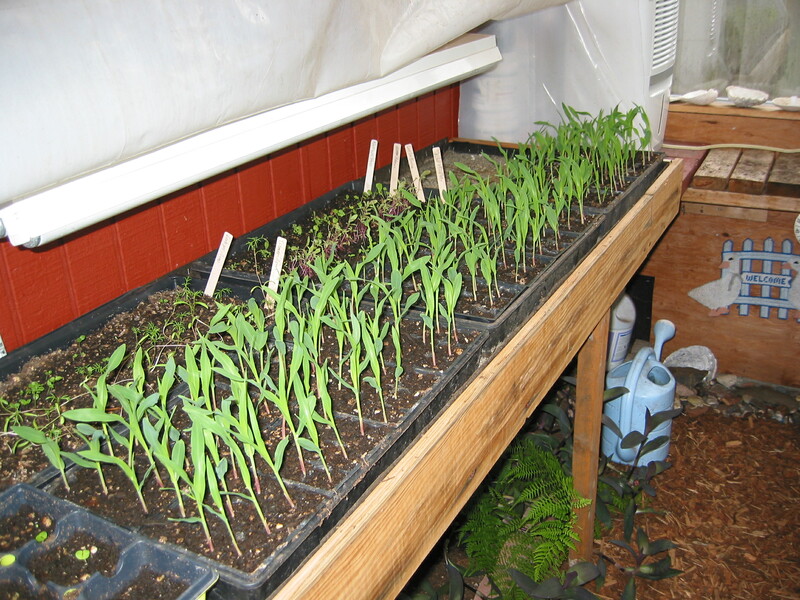 There’s also a shot itself of the corn which we started in flats and then transplant out to the garden. We also give a lot of them away to neighbors. We do the same with tomatoes and this year I went kinda hog wild and planted far more than I can use and I suspect I’ll have a hard time giving them away. If you’re in the Seattle area give me a holler and I’ll share with you. I’ll have to get creative to see what to do with all of these local plants that are doing so well. I bought some heirloom tomatoes from the Seed Savers’s Exchange this year – a Ukranian Purple, a Beams Yellow Pear, and an Emmy that is a golden orange that they sent as a bonus to me, like I needed more seeds! I also planted a local variety called Siberia because it’s a short season grower and we don’t have a long hot summer here in the Northwest. So I’m hoping it will put on some good fruit. Last year I did all heirlooms and they dd so well I thought I’d try them again. 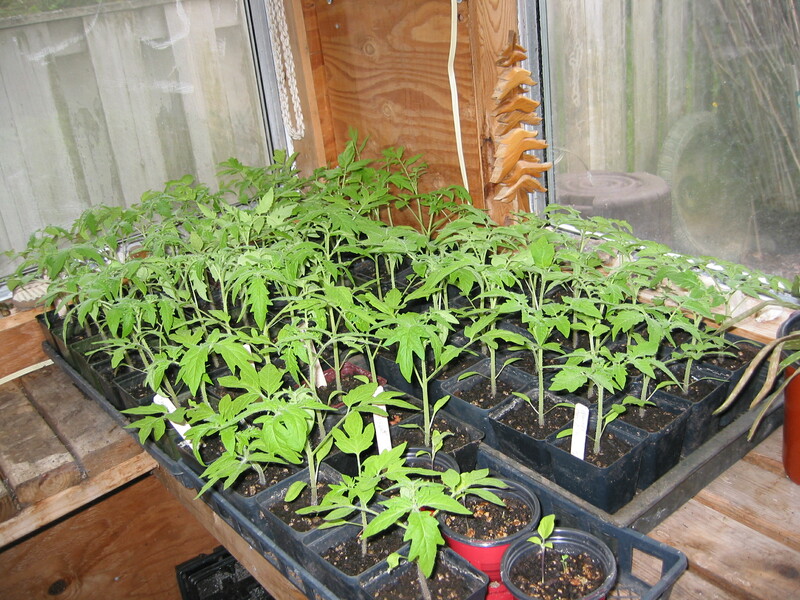 I plan to plant at least 4 types of tomatoes and see how they all do. We’ve already started planting the veggie garden with some greens I started earlier and some onion sets and some lettuce starts we got at the nursery. It’s looking good. So I’m keeping this a short post. I just wanted to share what it’s like to have a greenhouse and how wonderful it is to be able to start your own plants. Some I have better luck with than others but it’s OK. I’ll have plenty of plants to put out into the garden and tho it may not be totally cost effective to do all this it sure does pay off in the good it does for my soul to garden and take care of these baby plants till they can become the giants some of them become. I can’t wait to see the results. If you have a greenhouse or just a cold frame I hope you’re having good luck yourself in growing things so you can plant them soon. We intend to put things out this weekend so they’ll have a good chance of growing into good size plants soon. Happy gardening to you all and good luck with your starts.